If you've worked any kind of hands-on job you've probably had a pair of boots that you just wanted to throw out the window. As important as choosing a good pair of quality work boots is to your continued job performance, it shouldn't be tricky or confusing. Understanding what's available in safety toe footwear and how it functions in a particular work environment will help you know what you need and don't need and allow you to choose what's best for you. Choose steel toe boots for the ultimate protection for industrial and construction jobs, plus other jobs where high protection is key. When choosing your steel toe boots, make sure that they meet ASTM Standards F2412-05 and ASTM Standards 2413-05. Make sure that these boots also meet all of the requirements set forth by your employer. For example, is it important that your boots be waterproof? Should they have heat resistant soles or be oil resistant? Ensure that the protective caps of your boots fit your feet well. Some are roomier than others, and there are more than one style and shape of cap. Pick what suits your feet the best. Composite toe work boots pass freely through metal detectors and are typically lighter than standard steel toe work boots. Composite toe work boots use materials such as Kevlar, plastic, fiberglass or carbon fiber to reinforce the toe; this provides protection against hazards and accidents without the weight of steel. Make sure that your composite toe footwear meets ASTM standards as well. Metatarsal boots provide protection for the foot, including the metatarsal bones, and are an ideal choice for hazardous work sites. You can choose steel toe boots or composite toe boots. You should choose metatarsal boots that meet ASTM Standards F2412-05 and ASTM Standards 2413-05. If you need the highest level of protection, you may want to consider work boots with puncture resistant outsoles for added bottom layer protection. Choose static dissipative shoes if you work in electronic component manufacturing or a similar field. If you work in electronic assembly, you don’t want sparks of static electricity to damage the chips you’re assembling or the equipment you use. Wearing static dissipative shoes allows the electricity to flow between you and the ground and they also provide a measure of electrical insulation. If you’re an electrician, ask about electrical hazard shoes that help insulate you from the ground. When you have familiarized yourself with materials, you will be able to make a more informed decision about the type of footwear you would like to wear on a day-to-day basis. Materials can dramatically impact how the footwear fits, how much air is circulated and how long the work boots will last. Full-grain leather: This is not a manufactured material; therefore it has exceptional strength and feels tremendously smooth. You’ll appreciate its long-lasting durability, great fit (once it has broken in) and ruggedly-handsome appearance. Nylon: Work boots are commonly made with panels (or sections) of this material to add breathability. This fabric is also astoundingly lightweight and can resist abrasions terrifically well. If you’re planning on purchasing work boots with nylon, ensure that it is also waterproof, or you may be subjected to unpleasant contact with moisture/water. Rubber and PVC: This type of work boot is impervious to water, so you are much more likely to remain dry in all types of working conditions. These lightweight materials are also amazingly easy to clean. 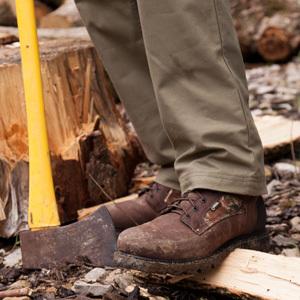 Some styles have been outfitted with a safety toe, so you’ll still receive valuable protection. The downside is that you are unable to adjust the fit, which could lead to them feeling cumbersome. Shanks: Generally made in steel or fiberglass, this feature is built into the base of your boots. With a shank, you’ll be able to maintain more balanced, steady footing. They also provide exceedingly comforting arch support, which helps you to be on your feet for the duration of the day and remain comfortable. Waterproof Leather vs. Waterproof Membranes/Linings: There is a DRASTIC difference between these two descriptions. To provide a boot with waterproof leather, a silicone-based mixture must be applied to the material. While, it can be useful, it is notorious for limiting the footwear’s breathability. Whereas, a waterproof membrane/ lining is built directly into the footwear and prevents water from coming into contact with the boot’s interior. Now, that you’re more well-versed about the types of boots available, are familiar with the things to look for and are informed about the materials, you’ll be able to choose the best pair of work boots for you!